Here is the list of the hotels near Échalou. Book your hotel near Échalou today, Thursday 16 May for the best price, reservation and cancellation free of charge thanks to our partner Booking.com, leader in on-line hotels reservation. Below here is the list the 50 closest hotels of Échalou, sortable according your criteria. You will find the position of these accommodations on the Echalou hotels map. Le Presbytere is a 19th-Century property set in a 8-hectare park, located in Saint-Bômer-les-Forges and just 7 km north of Domfront. It offers a guest lounge and a selection of books. The rooms at Le Presbytere are decorated in a contemporary style and include a seating area with a CD player. There is also an en suite bathroom, which is complete with a hairdryer. After enjoying the continental breakfast, you can drive just over an hour to the D-Day Landing Beaches. Free private parking is provided and other local attractions include Saint-Malo, a 1 hour and 30-minute drive away. La Bouscaudiere is situated in Lonlay-lʼAbbaye. This holiday home features a garden, barbecue facilities and free WiFi. The holiday home is fitted with 2 bedrooms, a flat-screen TV with satellite channels and a fully equipped kitchen that provides guests with a dishwasher, an oven, a washing machine, a microwave and a toaster. Bagnoles de l'Orne is 26 km from the holiday home, while Vire is 37 km away. Set on 18 hectares of private grounds, Belle Vallee is located a 5-minute drive from Domfront and its chateau. You can admire the 19th-century house, relax by the fireplace in the lounge or explore the orchard. The accommodation at Belle Vallee includes guest rooms and a cottage. Each one combines a traditional and contemporary style, and features both free Wi-Fi access and an en suite bathroom. If you are staying in the guest rooms you can enjoy a continental breakfast and if you are in the cottage, you can prepare meals in your kitchen. Free private parking is provided on site and the Andaines Forest is 23 km away. Other local attractions include the town of Flers, which is 25 km from the property. Holiday Home La Chevallerie Pilet is located in Lonlay-lʼAbbaye. Guests staying at this holiday home have access to a fully equipped kitchen. The holiday home is equipped with a TV and 3 bedrooms. Bagnoles de l'Orne is 30 km from the holiday home, while Vire is 33 km from the property. The nearest airport is Deauville – Normandie Airport, 119 km from Holiday Home La Chevallerie Pilet. Hotel The Originals Le Manoir du Lys (ex Relais du Silence) is located in the heart of a forest, only 1 hour from Mont Saint Michel. The hotel offers indoor and outdoor swimming pools and free WiFi internet access. The individually decorated guest rooms are all soundproofed with a TV, and a telephone. Each room offers a terrace or view of the orchard. Inventive, regional cuisine is served in Hotel The Originals Le Manoir du Lys' restaurant, which has 1 Michelin star. The hotel also offers free parking and a shuttle service to the railway station. Appartement Ilianah is set in Domfront. Guests staying at this apartment have access to a fully equipped kitchen. The apartment consists of 1 bathroom and a living room. A flat-screen TV is available. Guests can also relax in the shared lounge area. Bagnoles de l'Orne is 20 km from the apartment, while Vire is 44 km from the property. The nearest airport is Deauville – Normandie Airport, 104 km from Appartement Ilianah. Bed and Breakfast Yvrandes Preferred hotel ! Situated in Yvrandes, Le Rocher B&B offers 3-star accommodation with a garden, a terrace and a shared lounge. Featuring a 24-hour front desk, this property also provides guests with free WiFi and private parking on site. All guest rooms at the bed and breakfast a private bathroom a shower and free toiletries. Le Rocher B&B provides certain rooms that include a patio, and each room includes a kettle. The rooms come with a seating area. Evening meals can be prepared by the hosts if you reserve in advance. 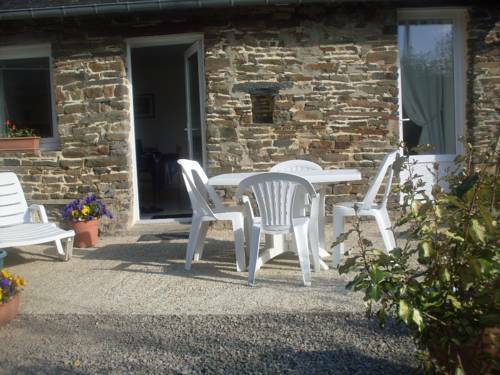 Bagnoles de l'Orne is 30 km from the accommodation, while Avranches is 45 km from the property. The nearest airport is Carpiquet Airport, 72 km from Le Rocher B&B. Numero CINQ B&B is set in a 19th-century town house located in Domfront, a 2-minute walk from the Medieval centre. Free WiFi access is available. Accessed by an original 3-story spiral staircase, rooms all have a view and come with a private bathroom, toilet and a hairdryer. Some of them have a fireplace, a desk and a garden view. Breakfast is included in the price and it is served every morning in the communal dining area. Packed lunches can also be requested. The property is on the Velo Scenic and the Velo Francette cycling paths and there is a garage where guests can securely store their bikes. Set in Beauchêne, La Petite Maison offers a hot tub. The property features views of the garden and is 29 km from Bagnoles de l'Orne. Free private parking is available on site. Towels and bed linen are available at La Petite Maison. The country house features free WiFi in some areas. The medieval town of Domfront is 19 km from La Petite Maison, while Vire is 29 km from the property. The nearest airport is Deauville – Normandie Airport, 85 km from the property. Four-Bedroom Holiday Home in Bagnoles de l'Orne is set in Bagnoles de l'Orne. Guests can enjoy the free WiFi. The holiday home includes a living room with a TV and a DVD player. A dishwasher, a microwave and a fridge can be found in the kitchen. Flers is 28 km from the holiday home. Deauville – Normandie Airport is 111 km away. Bois Joli provides 3-star accommodation in the heart of Bagnoles de l'Orne. It is housed in a 19th-century Norman villa on the edge of the Ferté-Macé forest. Bois Joli offers free Wi-Fi, fax and private parking facilities. Each room has cable TV and a private bathroom. The hotel’s restaurant serves seasonal cuisine and offers fixed-price menus. Bois Joli guests are invited to enjoy the nearby casino or local activities such as mushroom picking, horse riding and golf. Free on-site parking is available. Located in the city centre, Au Bon Accueil offers a traditional restaurant that serves meals made with local products. Guests can enjoy a drink at the bar or on the terrace. The rooms at Au Bon Accueil have a private bathroom with a hairdryer and a bathtub. They all provide a TV and free Wi-Fi access. A continental breakfast is available each morning and packed lunches are also available upon request. The restaurant room features an original fireplace. The hotel is situated 7 km from Bagnoles-de-l’Orne, its casino and its thermal bathes. There is a free, public car park on site. Bed and Breakfast Juvigny-sous-Andaine Preferred hotel ! Lenard Charles Bed & Breakfast is located in Juvigny-sous-Andaine and offers a garden with BBQ facilities. You can relax in the shared lounge and surf the web with the free Wi-Fi connection. The rooms at Lenard Charles Bed & Breakfast feature a TV and a private bathroom with hairdryer. A continental breakfast is included in the rate and served each morning in the dining room. You will have access to a shared kitchen. There are a restaurant and a bar just 250 metres from the B&B. Free private parking is possible on site and Lenard Charles Bed & Breakfast is 8 km from Bagnoles-de-l'Orne, where you can find a spa, thermal springs and a casino. Located in Domfront, Gite Le Relais Saint Michel provides accommodation with free WiFi and a garden. The bed and breakfast offers a terrace. If you would like to discover the area, cycling, fishing and hiking are possible in the surroundings. Bagnoles de l'Orne is 20 km from Gite Le Relais Saint Michel. The nearest airport is Deauville – Normandie Airport, 108 km from the property. Appartement du Lac is set in Bagnoles de l'Orne. Guests staying at this apartment have access to a fully equipped kitchen. The apartment has 1 bedroom and 1 bathroom with a shower. A flat-screen TV is available. Flers is 28 km from the apartment, while Mayenne is 38 km away. The nearest airport is Deauville – Normandie Airport, 110 km from Appartement du Lac. Below here is the hotels map of Échalou. Names and details of Échalou hotels can be shown on the map clicking on the prices icons.